The Company was founded by the late John T. Roohan back in 1969. 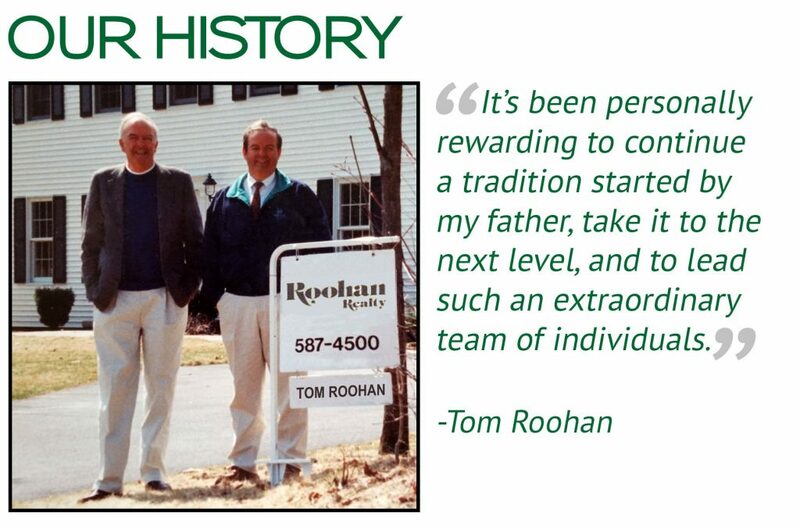 His son, J. Thomas Roohan, earned his real estate license in 1979 and currently serves as President. The first Roohan Realty office was established at Union Avenue, then moved to Court Street with a handful of employees. After a few years of consistent growth, the office was moved into the historic district at 48 Union Avenue. This magnificent building had been part of old Saratoga, used as student housing by Skidmore and Verrazano College. In 1996, with over 25 real estate agents, our office moved to 398 Broadway. In 2002, the Roohan Realty team was still growing, and the company moved one last time to a larger space at 519 Broadway – a prominent and historic downtown building that used to be the city’s community theater. With its dramatic facade of brick and two-story columns facing the Saratoga Springs City Center, 519 Broadway is now home to our modern and spacious offices and open for business 7 days a week. In the early 1970’s, the Roohan Realty team primarily focused on single family homes. Through growth, we have progressed to specialize in residential, commercial, new construction, and equine properties, and now serve eight counties across upstate New York’s capital region. Today, Roohan Realty has over 50 real estate associates and professional staff. Our company is #1 in market share in the city of Saratoga Springs, delivering experience and service that is second to none. What remains, however, is the company’s commitment to excellence in service and dedication to our community. A Tradition of Excellence & Trust Since 1969.